My dad carries me, my mother walks behind us. My family waves hello. The first time I went to the Philippines, I was under two years old. 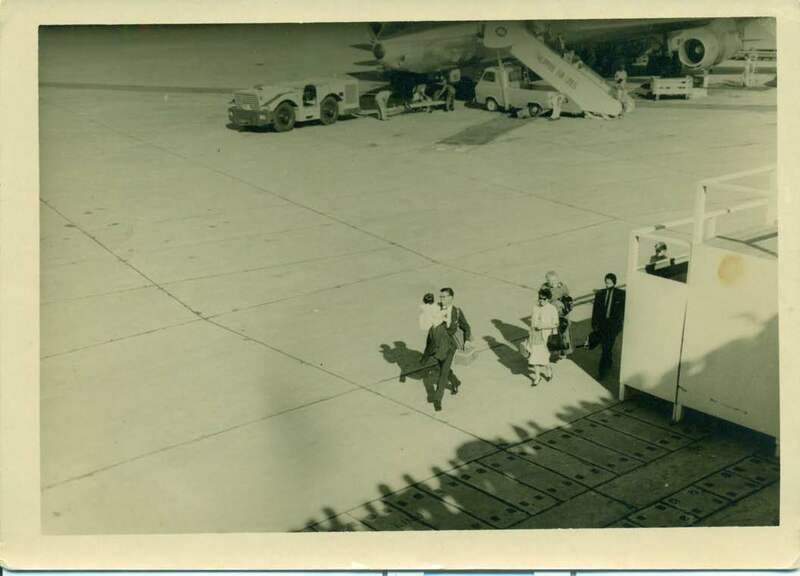 I have a sepia-toned photo—a wide shot of my parents walking across the tarmac at Manila International Airport. We are walking away from the nose of our airplane, its fat wings sweeping out of frame, and behind us is the long staircase we have just descended. My mother leads us in her stylish Jackie O way; my father follows closely behind. He is wearing a full dark suit, white shirt, and tie. You can see his black, plastic-rimmed glasses. You can see me, a toddler in a dress and pixie haircut, nesting in the crook of his arm. We are coming home, walking towards the building where 100 plus members of our clan are gathered on the balconies, waving at us. You can see that, too, in this old photo. We are coming home, though I have never been. The second time I went home was with the Dalaga Project, 37 years later. I have no memories of being in the Philippines before this trip—just vague images that pass before me when I’m not thinking—santol on my tongue is a sweet and sour memory; humidity on my skin is like the breath of my love— familiar, warm, intimate, mine; the clamor of one hundred voices, the laughter and the chime of their two hundred pieces of silverware on china, home. This is home. But I am working and I arrive with five young women who are my charges and I cannot let my guard down. I have forty old women marching in the street before me, I have no time for myself, save the short weekends when I return to Bituan or Macopa or the house in Macabebe. What becomes mine are the visits. Each night, when I am lying in my bed in Malate, Metro Manila, and I close my eyes, a thousand faces visit me. They bloom in the dark like smoke billowing in the sky. The faces are sometimes fine line-drawings of light, but mostly they pass before me like clouds. One after the other. Old men with crooked noses. Mothers with full faces and masses of hair. Grandmothers looking like wrinkled like old trees. Little baby faces, eyes closed, mouth open. Faces, only faces. They come to me each night. Remind me I am home. I know them, though I’ve never met them. The third time I go to the Philippines, the Towers in New York City have just crumbled to the ground and the world has changed. No one knows what will become of us after 9/11. I am not sure that I want to go, but I have been given a Senior Research Scholar’s award from Fulbright and it is an opportunity to visit the lolas and redeem my promise. I can tell their stories. I can help them fight for justice. After waking up alone one morning in Iowa and witnessing the plumes of smoke rising from the streets on television, after finally coming home to hold my own, I must leave my family in Milwaukee. Three of my siblings here have just had babies—two girls and a boy—and I must go without seeing the first year of their just-born lives. I go. This time, I am without my parents, without the dalagas. I go. This piece was originally published in the anthology, Hanggang sa Muli: Homecoming Stories for the Filipino Soul (Tahanan Books, 2012).